This recipe is adapted from one, credited to Flo Braker, on food.com. It is oh-so-good. The first time I made these, I tried topping them with soft honey nougat. That didn't go so well. The flavor combo was nice, but the nougat completely separated from the brownie. I still wanted to use honey, though, so I decided to make a kind of white chocolate honey ganache. Success! The new topping spread easily, held firm, and tasted great! Of course, chocolate ganache, caramel, or peanut butter frosting would all be amazing too. And, if one were so disposed, they might sprinkle chopped walnuts or pecans, or even honey-glazed nuts, over the top to make this decadent dessert even more irresistible! 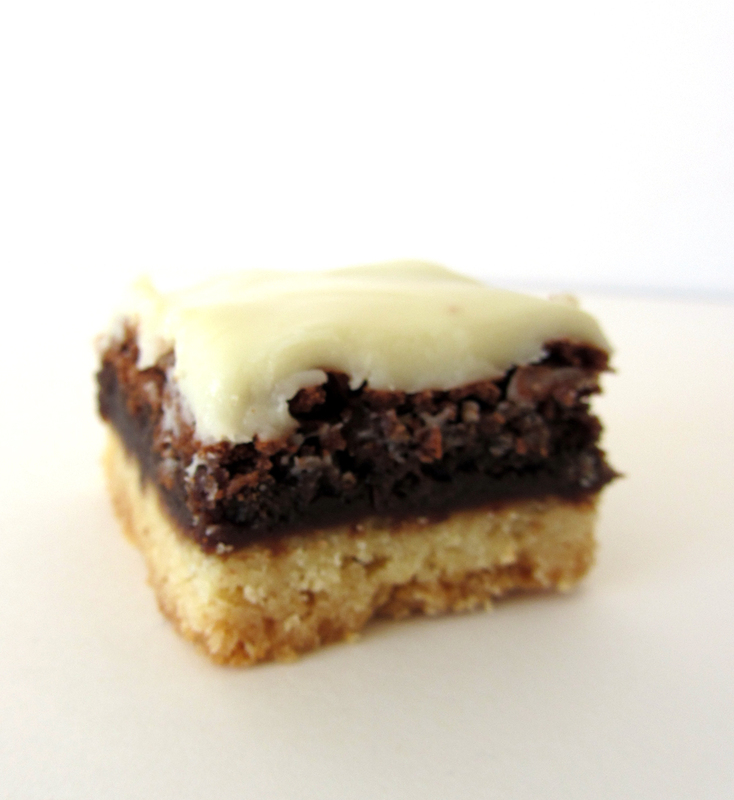 However you top it, shortbread and brownie = yum! 1. Preheat the oven to 350°. Line a 9" X 9" baking dish with parchment paper. 2. For the Shortbread: place the flour, sugar, and salt in the bowl of a food processor. Pulse to mix. Add the butter pieces and the vanilla. Pulse until the mixture turns to coarse crumbs. 3. Pour the mixture into the prepared dish. Press firmly and evenly into the bottom of the dish. 4. Bake for 20-25 minutes or until the crust is very pale golden. Remove the pan from the oven. Let rest 15 minutes. 5. For the Brownie: in a medium bowl, mix together the flour, baking powder, and salt. Set aside. 6. In a measuring cup, beat the eggs together with the vanilla and coffee crystals. Set aside. 7. In a medium bowl, place the chocolate, cocoa powder, and butter. Microwave for 15 seconds, stop, and stir. Repeat just until the mixture is completely smooth (do not overheat). 8. Whisk the sugars into the chocolate mixture. Whisk the egg mixture into the chocolate mixture until smooth. 9. Stir the dry ingredients into the wet until just combined - do not overmix. 10. Pour the batter over the shortbread crust and spread it into an even layer. 11. Bake for 30 minutes or until a toothpick inserted into the center comes out with only a couple of moist crumbs attached. 12. Transfer the brownies to a rack to cool completely. 13. For the Frosting: place the chocolate in a medium bowl. Microwave for 15 seconds, stop, and stir. Repeat just until the chocolate has melted - do not overheat. 14. Whisk in the butter, honey, and cream until the butter is melted and the mixture is smooth. 15. Spread the frosting evenly over the brownies (I do not frost the edges). Allow the frosting to set. 16. Cut the brownies into bars and serve!